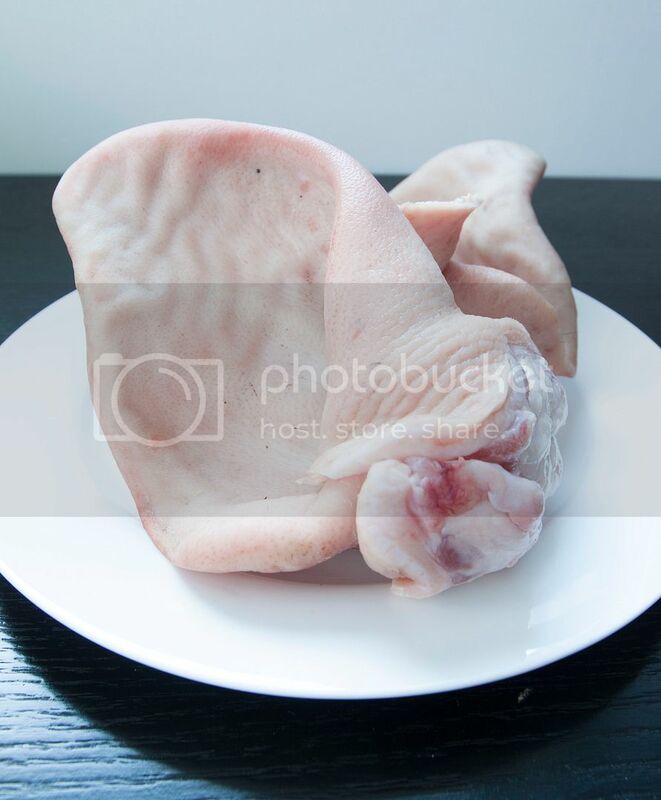 To be honest, I didn't expect actual pig ears could be this huge..
Don't be scared by its appearance, after all, ears are still part of a pig, and actually quite delicious. The skin does not contain as much fat as from other sections such as belly and legs. As a result, what you get in the end is gelatinous skin with a slightly crunchy bite from the cartilage in the center. Beware though, the texture can be addicting once you give it a try. Prepare a pot of water, add in two ginger slices and 1 stalk of scallion. Bring to a boil then add in pig ears. Bring to a boil again then lower the heat to keep it at a light simmer for another 3 minutes. This helps in drawing out the grayish dirty bits. Once ready, drain well and wait till the ears cool down before handling. Use tweezers to remove any remaining hair. Use a pot and add in 4 peeled garlic cloves, 1 stalk of scallion, 2 star anises, water, soy sauce, and Shaoxing rice wine. Also add in the pig ears. Bring to a boil then lower the heat to keep it at a light simmer. Cover with lid and cook for 90 to 120 minutes, depending on texture preference. Make sure to check on the stew couple times during the process. Perhaps move the ears around so every part can be cooked evenly. Meanwhile, finely chop 4 peeled garlic cloves, 2 red chilies, 1 stalk of scallion, and some cilantro. 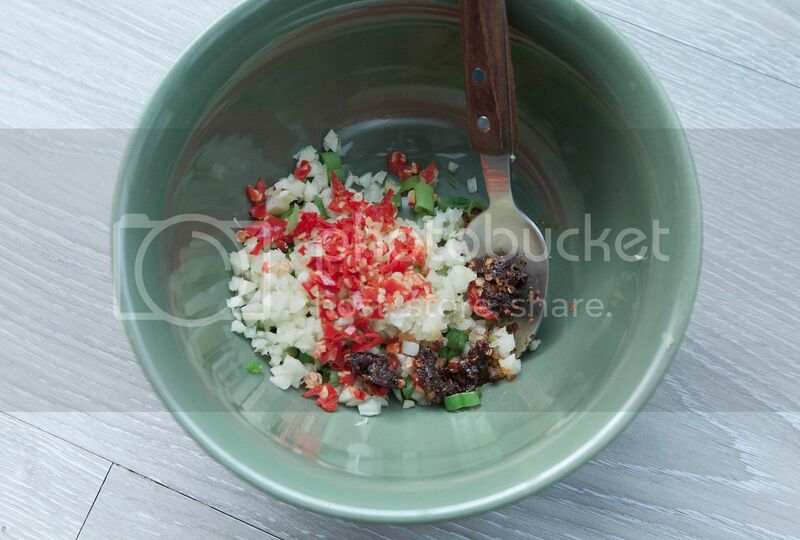 Mix the garlic, chilies, scallion, and some chili sauce in a bowl. Skip the cilantro first, I prefer to sprinkle them all over the plate right before serving. These are for one ear only, remember to double the amount if serving two ears. Mix the chopped ingredients with 2 tablespoons of black vinegar and a few dashes of sesame oil. No need to add more soy sauce since the stew is already salty enough. Don't throw away the extra stew sauce. You can use the same sauce to stew some potatoes, tofu, daikon, etc. 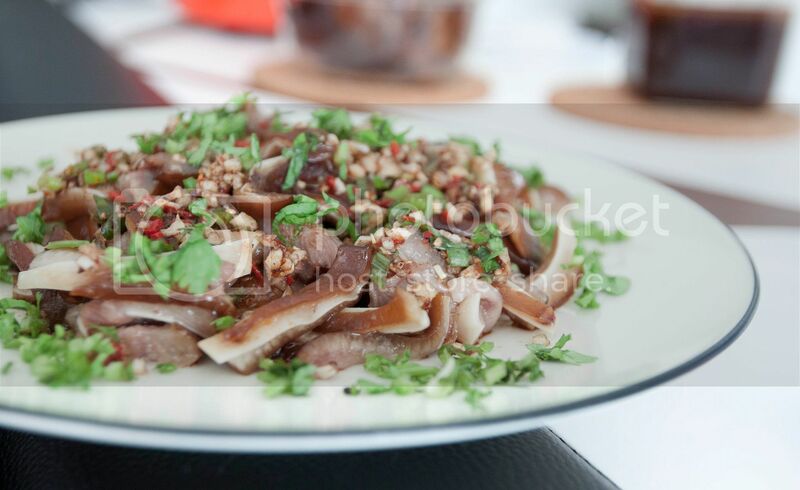 The sauce can also be reduced and use as a dressing or mix with dry noodles. 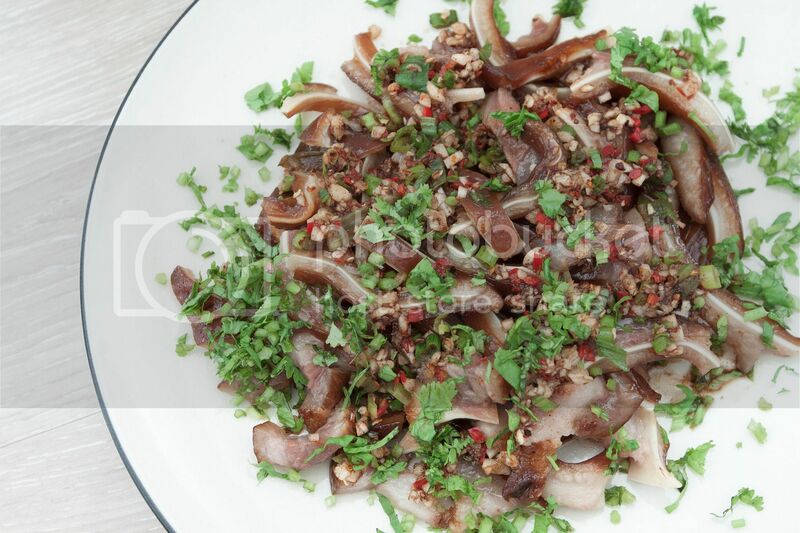 Place the stewed pig ear pieces onto a plate and drizzle all the seasonings on top. Sprinkle some freshly chopped cilantro before serving. If only serving one ear as a cold plate dish like what I did here, you can store the other in the freezer for up to two weeks. Just defrost one day ahead before next serving occasion. 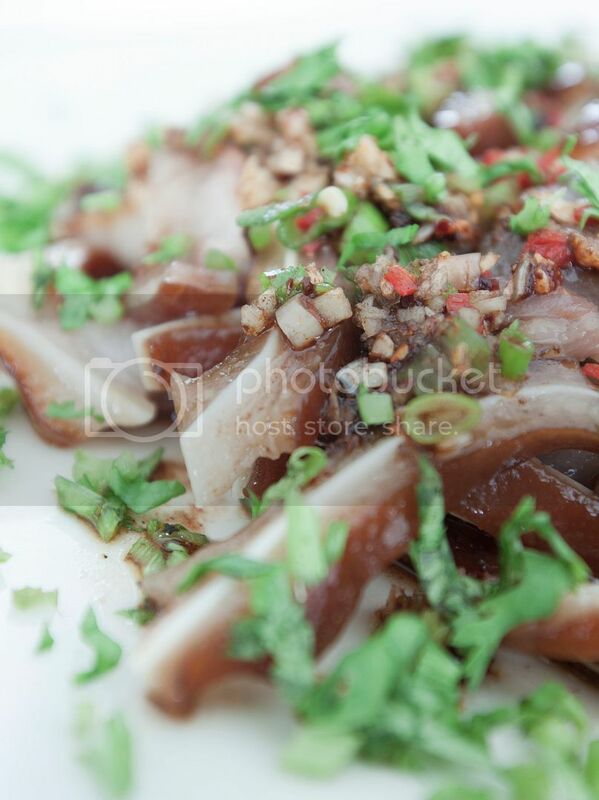 With such high quality Matsuzaka pork, all you need to do is sear sear sear!